This New Year’s Eve the bridge at the junction of Bloemgracht and Prinsengracht is again the scene of a thunderous, spectacular and by now traditional fireworks show, Joost Ritman’s annual treat to the neighbourhood. Ritman (1941) was born in Amsterdam’s Jordaan district and made a fortune producing disposable dishware for the aviation industry together with his two brothers. Yet he is even better known, also internationally, as the founder of the Bibliotheca Philosophica Hermetica, a unique collection of works in the field of Hermetic philosophy, mysticism, alchemy and related areas. The library is the largest in its kind and a true treasure house of ancient books and manuscripts that would make even Harry Potter’s mouth water. Ritman got the idea for an annual fireworks show when he felt that the turn of the millennium should not go unnoticed. 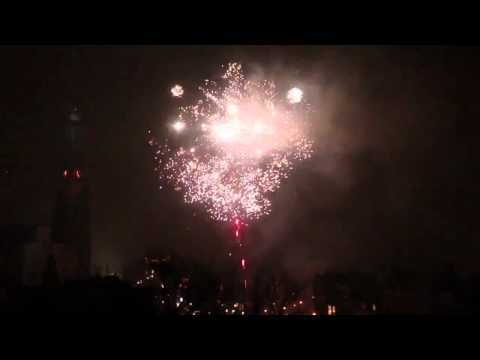 He approached Pyrofoor, an Amsterdam company of experienced fireworks professionals. He didn’t have to think long about where the show was going to take place. That bridge across Bloemgracht is of monumental importance to me. First of all because I was born and bred here and I still live here. But I also experience it as a kind of magical and historical crossroads. Surrounded by water, which is so vital for the culture and growth of Amsterdam. At the base of the Westertoren, across from the Anne Frank house, this place to me symbolizes everything this city stands for: assertive, proud, open, loyal, compassionate, firm and determined but at the same time also vulnerable. It’s always great to work with Mr. Ritman. Too often we are asked to provide what we ourselves call ‘explosive cigar stuff; we put down some boxes and off we go. But this is something else. Perhaps not every spectator will realize it, but a lot of thought goes into each fireworks show every year. This time the motto of the show is Back to the Source of the Light. The inspiration for the themes is always found in Ritman’s library, which he sometimes affectionately refers to as a ‘House of Living Books’ and a ‘Centre for Unconventional Thought’. The idea for his life’s work was born when he his mother gave him a 17th-century copy of Aurora, a work by the German mystic Jacob Böhme, for his 23rd birthday. That was a tremendous eyeopener, I suddenly saw the light. My powers of perception and my intuition as it were became one. It made me realize that there is nothing supernatural about the world around us. On the contrary, everything is part of one organic, interactive and totally self-evident whole. Salvation is only to be found in growing awareness. The love of rare printed works which was instilled in him at that time never left him. At first he collected on a modest scale, but this changed when he took over his father’s company together with his brothers in 1969. De Ster (The Star), founded on Bloemgracht in 1936, started out as a company specializing in polishing wax and disposable articles for the food service industry. Once the brothers took over the firm, however, they lost no time building a company that became an absolute market leader in plastic dishware for the aviation industry. The annual turnover in 1969 was a million guilders; twenty years later it was more than 300 million. Joost Ritman now had the means to start collecting on a grand scale. But he did not forget his native city of Amsterdam either. Among the projects Ritman supported are the restoration of the Westerkerk, the Hortus Botanicus, the Posthoornkerk, the Nieuwe Kerk Foundation, the Rembrandthuis, the Joods Historisch Museum and the library of the Concertgebouworkest. In 1984 he decided to make his private collection of books accessible to the public. From then on a steady stream of scholars and writers found their way to the Bibliotheca Philosophica Hermetica on Bloemstraat. One of them was Umberto Eco, who drew inspiration for his Foucault’s Pendulum from the collections. says Ritman, who also aspires to explore with his collection the creation’s innermost ground of being, the sources of Western culture and the unifying principle. From 1993 Ritman’s firm was confronted with several crises. The first time was when the Gulf War caused a slump in passenger aviation. To make sure the library could survive, he was forced to divest himself of his interests in the Ster Disposables. The Ritman family began a new company in plastic dishware and again turned it into a success. But new setbacks followed in 2010 and several parties laid an embargo on his collection. The recurring theme in this story of misadventure is that banks are not sensitive to the lasting value of ‘unprofitable assets’ like a collection of books. More than once the press spelled doom over the Ritman Library, but supported by prominent institutions and private persons, Joost Ritman each time managed to steer his library into less troubled waters with relatively little damage. And now, in the autumn of 2014, prospects are definitely rosy, about which perhaps more in a next issue. Ritman likes to refer to his fireworks using metaphors of light, sacred fire, creation and not forgetting the big bang preceding it. He easily connects all this with the theme of his library. He doesn’t need much prodding, however, before he admits he is also into the thrill of the thing. Thursday January 1st 2015, corner of Bloemgracht/Prinsengracht, at the midnight hour.